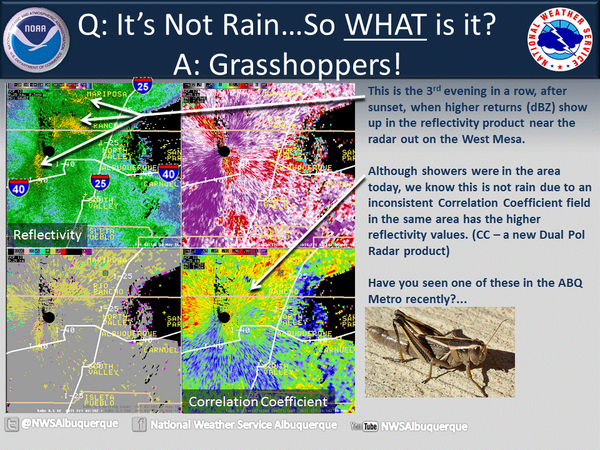 What's The Difference Between Grasshoppers and Locusts? There is something swarming in New Mexico. The infestation is so thick that clouds of insects are showing up on the radar like, well, real clouds. “It is a nuisance to people because they fly into people’s faces while walking, running, and biking," John R. Garlisch, extension agent at Bernalillo County Cooperative Extension Service, told ABC News. "They are hopping into people’s homes and garages, they splatter the windshield and car grill while driving, and they will eat people’s plants." So what are they? Well, news outlets are calling them grasshoppers, but if they're swarming, does that make them locusts? A New York Times article from a similar occurrence last year went so far as to say that grasshoppers become locusts simply by swarming. In a 2010 article on locusts that was published in the Encyclopedia of Animal Behavior, Alexandre Vsevolo Latchininsky, Extension Entomologist for the State of Wyoming, explains that "all locusts are grasshoppers but not all grasshoppers are locusts." 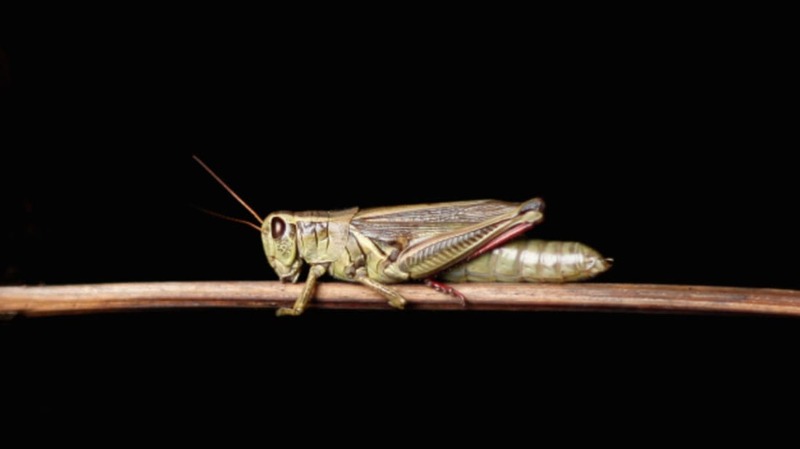 He defines locusts as "short-horned grasshoppers (Orthoptera: Acrididae), distinguished by their density-dependent behavioral, physiological, and phenotypic polymorphism." The phenotype mutability refers to the fact that for some subspecies of locusts, the different stages of life are marked by different colors and even body shapes. However, it is the behavioral aspect—the mass grouping together—that is most notable. The act of swarming, or exhibiting a so-called "gregarious phase," is the most obvious characteristic that identifies a subspecies of grasshopper as a locust. Latchininsky explains in his paper that "out of more than 12,000 described grasshopper species in the world, only about a dozen exhibit pronounced behavioral and/or morphological differences between phases of both nymphs and adults, and should be considered locusts." And in fact, the tendency to swarm together is a relatively recent phenomenon in grasshopper evolution. However, what we have in New Mexico is an uncharacteristic swarming by members of the Acrididae family, which are the non-swarming members of the grasshopper designation. Latchininsky tells mental_floss that this has happened roughly a dozen times in evolutionary history. However, he cautions that, "these occasional gatherings do not mean that these grasshoppers are locusts! There are only a dozen or so true locust species in which the increase of density causes behavior changes followed by physiological, morphological and other phenotype changes." Based on extenuating factors—last year's monsoon season coupled with a dry winter—this current phenomenon seems to be a case of too many grasshoppers in too little space as opposed to a proclivity to swarm. Still, Latchininsky speculates that it, "may be a first evolutionary step towards this species becoming a locust in a distant future."